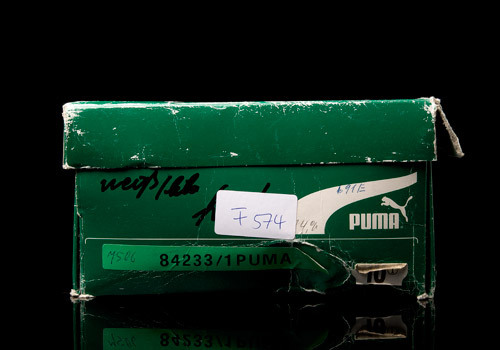 It’s actually quite rare to find a high top vintage PUMA trainer from the 80′s or 90′s that’s not super tasty. 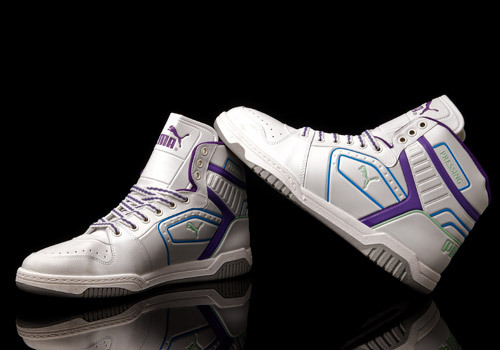 What’s typically most appealing is their chunky, weighty soles, thick padded uppers, and those wild designs incorporating bright colors against clean white canvases. Some even push it a step further with experimental layering of different materials and textures. 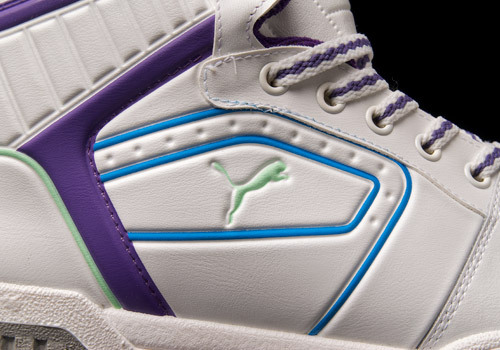 Unfortunately that’s exactly where the PUMA Pressing Hi lets us down. Overall the upper is basically flat, giving only the illusion of texture and shape with its embossed detailing, brought to life by a three part colorway. 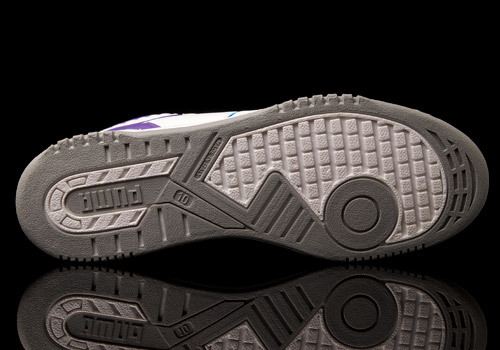 The bright funky tones surely look fresh, and nothing bad can be said for the mediocre outsole that is certainly adequate for casual and athletic use, but there just isn’t any weight to this shoe. 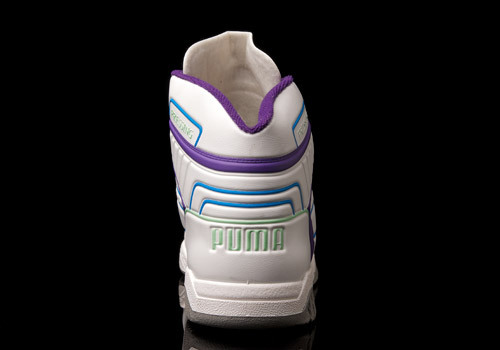 As well the purple sockliner is made of a synthetic textile that feels fragile and itchy. 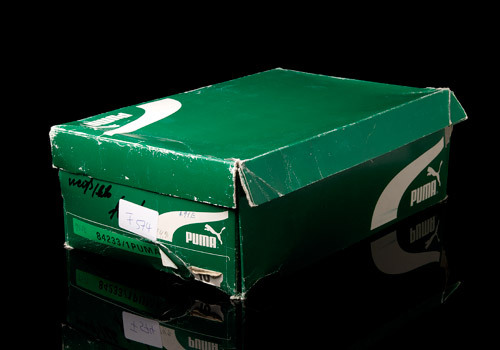 Despite the criticism, the laces and tongue are phenomenal, the former sporting a design that can be seen in the German cat company’s more modern releases of the PUMA Cat 2 ST. As for the tongue, it’s a thin, rubbery material with a soft cotton backing, particularly creased near the sides to allow a slim, flush fit against the ankle, or alternatively an easy pop-out above the upper eyestays. But mostly importantly: how’s the fit? It’s definitely comfortable, that’s for sure, however the toe box and ankle collar are both extremely thin for a basketball shoe and therefore demand delicate wear or threaten with the nearly immediate consequence of ugly creasing and eventual cracks. 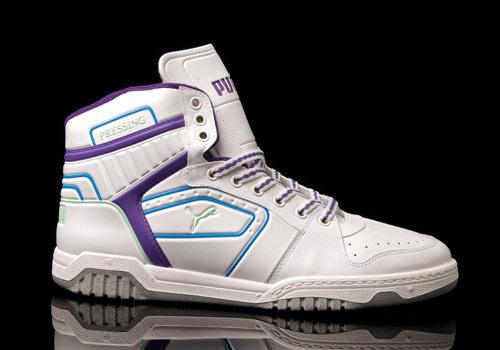 Only the lower heel has stiff support and even this is nothing compared to the likes of PUMA’s more typical models. 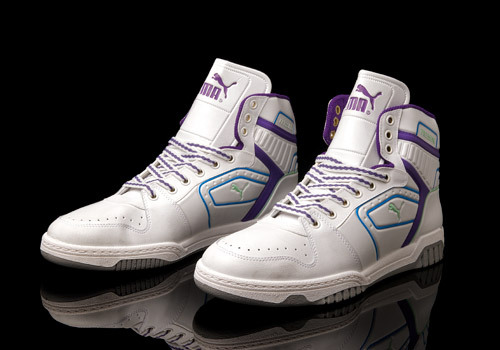 I will openly admit I’m a sucker – even an addict – for almost anything baskteball-related in a high cut form made by PUMA back in the 80′s and 90′s (yes, even the ugly ducklings too), but when it comes to the PUMA Pressing Hi, I’ll take a pass for a more durable, supportive model.